If the Ferraro deal was bad news for Clinton, then this is about, oh, a thousand times worse for Obama. Sure, this guy isn't officially working for Obama's campaign while Ferraro was working for Clinton, but that does not matter a single bit here. Perhaps it technically does, but most people who see and hear all of this will not care if he is officially working for Obama or not. Unless Obama totally distances himself from this "preacher", and I mean totally, then this will not go away for him. Also, like I said, eve if he does do that, this will still damage Obama in the eyes of many people and it doesn't matter if you think that they should feel that way or not. Washington Dispatch: Televangelist Rod Parsley, a key McCain ally in Ohio, has called for eradicating the "false religion." Will the GOP presidential candidate renounce him? Who will be the next contestant on "I've Got the Most Offensive Preacher?" Come on, Clinton. Convert to Scientology! The difference Jason is that Obama is by all acounts, a pretty close friend and member of his church. (anyone know how long he's been a member?) To continue going to and participating in a church for years means there has to be a level of acceptance and agreement with it's principles, it doesn't have to be 100% but certainly enough to invest your time and money in. Big difference between that and receiving an endorsement. That settles it. I'm not voting for Obama now. I'm also not going to punch myself in the nuts. It was a tough call, but this made the decision easier. Senator Obama's been a member of that church for about 15 years. Do you agree with everything your pastor says? Every sermon he preaches? JasonF, I'm sorry, but you're really reaching to make this not seem like that big of a deal. I'm not even saying it's a huge deal to me, although I admit that it will lessen my opinion of Obama if he doesn't totally, 100%, denounce this guy. I'm just saying that this is going to mean a lot to a lot of people. I mean, some people don't want to vote for Obama simply because he's black, or because of his middle name, or because of his wife's statements, and so on. Now I know those are pretty weak reasons not to vote for the guy, but that's true for many people. If some people wont vote for him because of such simple things, just imagine what this will do for those who were on the fence about voting for him. Obama has defended this guy more than once in the past. He obviosuly hasn't said that he agrees with him, but he has still stood up for him. Trying to just laugh it off by saying that the guy is like a silly uncle that says things that embarrasses you, and so on. Obama has donated thousands of dollars to the church. It will be interesting to see what comes of this over the days, weeks, and months. I don't agree with everything my pastor says either, I doubt anyone does unless they're a complete and total sheep, but this is different. How many of you would continue going to any sort of church that was led by someone that says such things? I sure know that I wouldn't, and I doubt any of you would either. About 95%, about the only thing I disagree with his just his phrasing sometimes. But this stuff is absolutely disgusting, and I'd be running out of that church the moment I heard that. This is Fred Phelps territory as far as I'm concerned. I'm sorry to break up the DVDTalk Obama Fan Club, but if the stuff this guy is saying is as bad as everyone is making it out to be, then I think it's fair to hold it against Obama. I'll reserve judgement until I can watch the clips. I think it's perfectly fair to hold it against Senator Obama. I just disagree with the whole "OMGWTF!!!! When people hear this, they are going to tar and feather Obama!!!" thing some people seem to have going on. Don't get your hopes up on controversial material if you haven't seen it yet. It's really nothing worse than you'd hear from Farrakhan or the like, I gather. And when I still attended services on a regular basis I did not agree with everything my pastor said or stood for. However, if he professed views that were abhorrent to me, and did so on multiple occasions, I most certainly would no longer be a member of his congregation. Do you seriously believe the media is going to bash Obama? However, if he professed views that were abhorrent to me, and did so on multiple occasions, I most certainly would no longer be a member of his congregation. btw: I still attend services on a regular basis. I disagree. The stuff Wright says is way worse than Farrakhan. Wright is just like Hitler (Black Hitler, of course, not Regular Hitler). Sarcasm aside, Wright says some very provocative things about race in America and he does so in very provocative language. But it's nowhere near as hateful as some of the stuff I hear from religious leaders on the right. Wednesday morning, the Clinton campaign sent reporters and bloggers covering the campaign a statement that consisted of questions and comments under the title of "Keystone Test: Obama Losing Ground." The Obama campaign's communications department decided to annotate those questions and comments with some comments of their own... and boy, they held nothing back. Below you'll find the annotated e-mail that has been making the rounds of the media. The Obama campaign's comments are in bold. The path to 1600 Pennsylvania Avenue goes through Pennsylvania so if Barack Obama can't win there, how will he win the general election? After setbacks in Ohio and Texas, Barack Obama needs to demonstrate that he can win the state of Pennsylvania. Pennsylvania is the last state with more than 15 electoral votes on the primary calendar and Barack Obama has lost six of the seven other largest states so far -- every state except his home state of Illinois. Pennsylvania is of particular importance, along with Ohio, Florida and Michigan, because it is dominated by the swing voters who are critical to a Democratic victory in November. No Democrat has won the presidency without winning Pennsylvania since 1948. And no candidate has won the Democratic nomination without winning Pennsylvania since 1972. But the Obama campaign has just announced that it is turning its attention away from Pennsylvania. This is not a strategy that can beat John McCain in November. In the last two weeks, Barack Obama has lost ground among men, women, Democrats, independents and Republicans -- all of which point to a candidacy past its prime. For example, just a few weeks ago, Barack Obama won 68% of men in Virginia, 67% in Wisconsin and 62% in Maryland. He won 60% of Virginia women and 55% of Maryland women. He won 62% of independents in Maryland, 64% in Wisconsin and 69% in Virginia. Obama won 59% of Democrats in Maryland, 53% in Wisconsin and 62% in Virginia. And among Republicans, Obama won 72% in both Virginia and Wisconsin. But now Obama's support has dropped among all these groups. "The chikenzz, have a come home to roooooost!" Great. More free publicity for Popeye's. Good news! There will be more debates! Both the Clinton and Obama campaigns have accepted an invitation to debate in Philadelphia on April 16, and the Obama campaign has accepted an invitation to debate in North Carolina on April 19. Only a month to stew over who will get the first question. 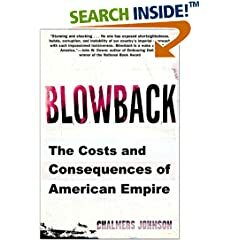 Why are we so scared of the truth that our own questionable (to put it mildly) foreign policies in the Middle East had a lot to do with the 9/11 attacks? Do people still really believe we were attacked "just because we're free" or some such nonsense? Obviously, there were many factors, but our own actions had a lot to do with 9/11. That's not an absurd statement. I mean, OK, this guy appears pretty flamboyant, but his premise isn't far off the mark, and frankly, the idea deserves recognition. It was probably the one thing I admired about Ron Paul. To me, an honest acknowledgment of the effects of our imperialistic tendencies is a good mindset for a president to be in. Can you back up your implication that Parsley is "McCain's pastor", analogous to Obama and his pastor?